Beebe Healthcare has added hyperbaric oxygen therapy to its comprehensive wound care program, which will take on a new name – Wound Healing and Hyperbaric Medicine. The program will open March 7, 2016, at a new location in the Medical Arts Building at the Beebe Health Campus near Rehoboth Beach (Route 24). Beebe will be installing the BARA-MED “Select” hyperbaric chamber, which provides the most advanced and effective treatment available. 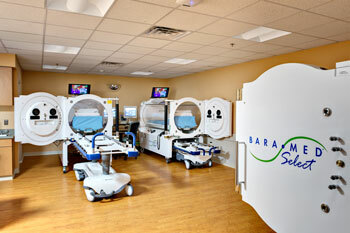 Manufactured by Environmental Tectonics Corporation, the BARA-MED “Select” is designed to protect patients from inner ear squeeze, a major discomfort that competing hyperbaric chambers fail to address. The chamber is spacious, temperature-controlled, and runs quietly, reducing patient anxiety. It is equipped with an entertainment system, enabling patients to watch videos during treatment. The Beebe Auxiliary helped fund the purchase of two chambers. Robert A. Portz, MD, a board certified physician and member of Sussex Emergency Associates, is the Medical Director of the new program. Since 1998, Beebe Healthcare’s Wound Care program has provided state-of-the-art wound care for the community, offering interdisciplinary and comprehensive treatment. Hyperbaric oxygen therapy will add to this program and the new location will allow Beebe to continue to provide the best possible care for patients and their loved ones. Beebe’s outcomes-driven program focuses on healing wound(s) quickly. The healing rate is consistently greater than 96 percent, exceeding the national average. Many of these wounds went untreated for weeks or months before receiving specialized wound care. Top photo: Beebe Healthcare’s Wound Healing & Hyperbaric Medicine team is excited about the new state-of-the-art location and the addition of hyperbaric oxygen therapy, which will help many patients heal more quickly. Shown is Robert A. Portz, MD, the Medical Director of the new program. Second photo: Hyperbaric oxygen therapy chambers, designed by Bara-Med, are being installed in the new location in the Medical Arts Building at the Beebe Health Campus on Route 24. These chambers feature an open feeling as well as entertainment options for those having treatments.